YEH Kim Pak was 27 years old when he was arrested on February 2nd, 1963, along with over 110 anti-colonial activists on the mere suspicion of being Communists. Yeh was not a Communist, but he did fight for workers’ rights through the Singapore Coffee Shop Employees Union. The British police operation, codenamed Cold Store, was supported by the Malaysian and Singaporean leaders who used it against their political opponents. In fact, there is evidence that Singapore’s leader LEE Kuan Yew urged the reluctant British authorities to take action. 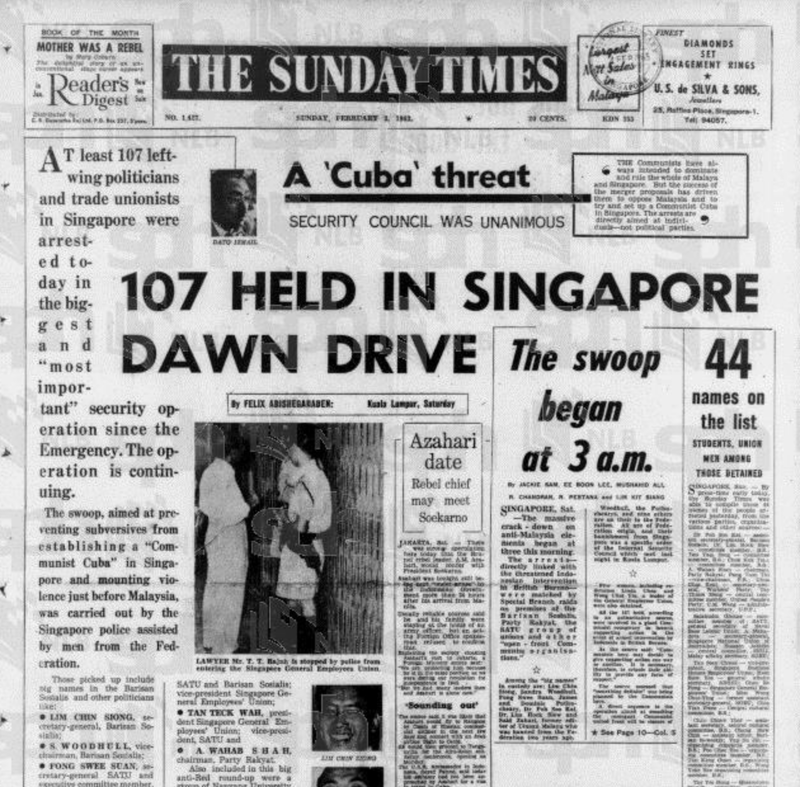 The opening of the British archives has led to a critical re-examination of the official narrative, but the picture is incomplete without thorough research into the relevant Singapore archives. The Singapore government has opened the latter to the selective study of its chosen historians. What must happen is the full opening of the Singapore archives to the scrutiny of independent scholars. Enough time has passed for state security not to be an issue. If the archives are not opened, the natural suspicion is that the government has something to hide. where got so many communists in Singapore? communists were the bogeymen used by pap evil lky to put fellow opposition in jail to consolidate power. good thing is there is justice under the sky. look at pap evil lky life. nothing good. died a lingering miserable death. worse sons and daughter and nephew at each other’s throats. in a Chinese society the family failure is proof pap evil lky is an utter fail. if a man cannot put his own house in order how can he rule a nation? cannot. all he can do is to put false charges on fellow opposition. long story short. pap evil lky did not live a good life. neither did he die a good death. karma enough. clap clap clap. We all know. Our parents and grandparents and some of us lived through this. No need of bigoted one-sided archives written to make the guilty look pure. Just ask the people who were there. Is that not good enough? Their stories and accounts should be interviewed, recorded and published as a witness to history of Singapore. The story of this country should not be based on just one narrative. it is clear by now it is operation coldstore was motivated by politics and a few individuals who wanted to gain power. Typically winners and victors write their own versions of history justifying what they had done. Throughout history the greed and craze for power and riches by man knows no bounds. Man dominate man by devious means plundering and conquering and later writing a clean self-justifying book coloring the goodness and benefits they had done. We only hear snippets and whispers of the massive disappearance of the Red Indians, the aboriginal tribes (some denied to speak their own language in their own land) all over the globe, and as it stands today the conquerors are portrayed as benign goody goody people that were responsible to civilize the indigenous people when in the early stages they behave like uncivilized savages “colonialists” when they came in from elsewhere and robbed the original people of their homeland, plundering stealing their wealth and now behaving as if nothing wrong had been done. In similar fashion, in politics, it is not uncommon for accusations of wrongdoings to be hurled at each other to justify actions taken. The winners and the victors will write and fill the pages of history as suits them. Communism, socialism, democracy, religion, beliefs, sectionalism, racism, groupthink, idealism, biasness, are all concepts or labels, understood and interpreted from various angles and lenses. How many man in the street labeled as a communist or a socialist really understand what the ideology of communism or socialism is really is all about. It is a vague description of the individual who happens to be or align himself with a particular group. Count yourself lucky if your opponents are not aggressive to the the point of dismembering you. The other suffering is to be locked up for years or decades on trumped up charges. It’s just your sheer luck who your conquerors could be, what their sense of justice is like or whether they have that fear of the One on High. The real true justice will only be unveiled in the grand court of Tua Pek Kong in the other dimension. Logic tells you that the final ultimate balance of justice karma will eventually be dished out sooner or later, in this world or the next.